Hello! It's been a bit since I last posted hasn't it? To be honest, I have been in a bit of a blogging funk because Spring is late in arriving this year. I have had zero inspiration and have just been sitting on my behind lamenting the cold weather and just cursing Mother Nature. Well, the old gal must have heard me and decided to make her appearance as we have had two full days of warm temps and full on sun! So much so, I got a bit too much of it during our garage sale over the weekend and I am now sporting a very red nose. Can you say Karma? LOL! Anyway, since it is so nice outside, I decided it was time to create the herb garden I had been planning for weeks now. I wanted something small to have up on the deck. Close to the BBQ and to the kitchen. Perfect for cooking inside and out. I had planned on using this plastic container the previous owners had left at the house but Mr. B expressed concerns about drainage and standing water under the container on the wooden deck. I considered it a valid enough concern that I went in search of something better. I found the perfect solution at Home Depot! It's made specifically for patio gardening! It's not too big, 24"x20" which is the right size for a variety of herbs for just the two of us. 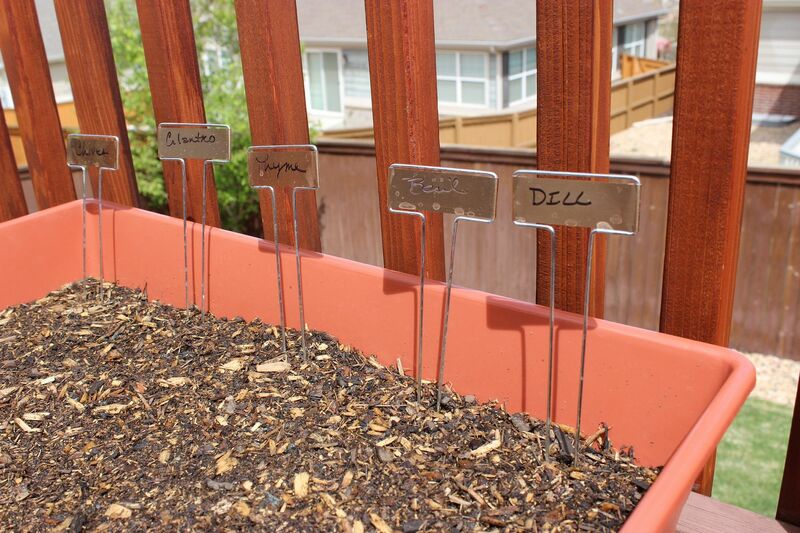 You could also use it for a small veggie garden too. Lettuce, cherry tomatoes, whatever you'd like to grow but don't have the room for! I love that it is on casters (included in the packaging) so I can easily move it out of the intense sun or, if hail is in the forecast, I can roll it under the eaves for shelter. Plus, it's elevated so, if I do over water or we get a rain storm it will dry out natually. A big thank you to DTL Herbs LTD (go over and like their Facebook page too!) for answering my questions on the best soil medium to use! After some back and forth it was a suggestion that I use a light garden soil (like from Miracle Gro). I was concerned that a normal potting soil would be too dense and I think the garden soil will work wonderfully! The container is self watering too! It has an upper screen that elevates the soil and below is a basin for the water. You fill it using the tube you see on the left side. I knew I wanted to grow dill for when we can pickles, basil because I love fresh basil, and thyme for some of my chicken recipes. Mr. B had me add cilantro for his homemade guacamole, and chives for the baked potato he loves with his grilled steak LOL. The seeds have been planted, 4 sets of each herb so now all that is left is to keep the water reservoir full and to, oh yeah, my favorite activity, wait! I'll keep you updated on the progress so be sure to come back for a visit soon. *This is NOT a sponsored post. 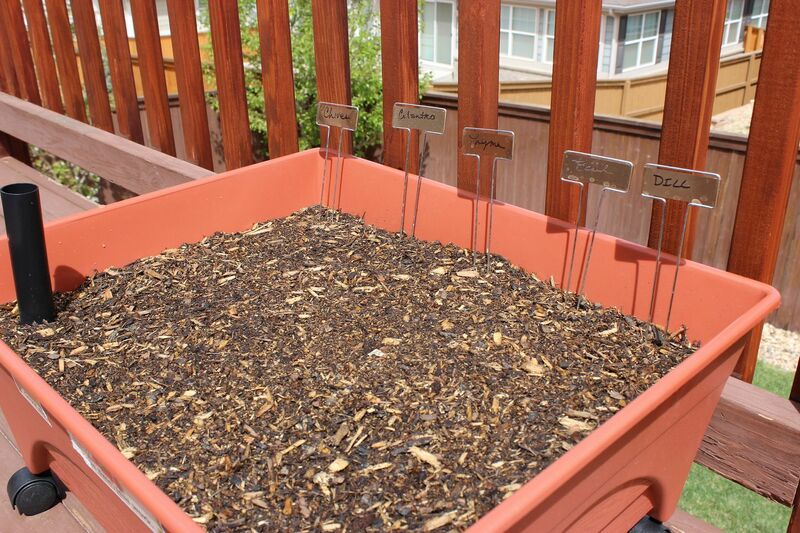 I just think this patio gardening kit is so cool I had to share it with my friends! I like that patio planter too. You could seed before the warmer weather and wheel it in and out according to temps. Love that planter. I will be finding one I hope at my Home Depot when I get home. It is perfect for what I want and the wheels make it perfect for my super sunny porch so I can make sure they don't get enough but not too much sun!!! Thanks DTL Herbs for you advice as I will follow that also! I have been busy planning a container herb garden. thanks for the tips. I like the idea of a planter on wheels. Looks great! Just one more tip: When you plant from seeds, you wan them to stay moist. Self watering planters rely on the plants' roots to draw water up into the plant, and seeds don't have roots yet, so even though you have a wonderful self watering planter, make sure the top inch or so of soil stays moist until the seedlings emerge and start to grow their own roots! In no time at all you will have a lush herb bed. Can't wait to see it! I like that! The self watering would come in very handy for me! I have a herb garden almost like this but mine doesn't have coasters:(( So Jealous!! I've always wanted an herb garden. Good luck with it! 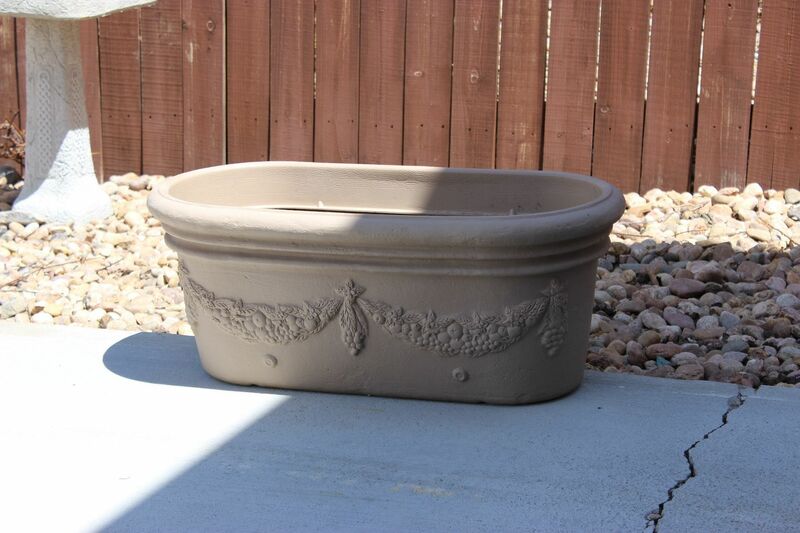 Love the patio planter Kathe! We just built a 4 ft by 4 ft raised bed for the garden (just for the herbs)...Hopefully will be able to get some in soon. I too cannot wait for good weather to come by soon! I love those sign holders. Where did you get them? I love this! We're in an apt, so all we can do is container gardening! I don't have green thumbs at all, but this looks like something I could actually do! Thanks, Kathe. That patio garden is cool! I am going to have to go look for that. Thanks for sharing! Love that patio container. What a nice way to garden in a small space. I was just thinking I need to start my plants. I planted all my herbs last year in containers and probably will do a lot of my gardening in container this year as I am not sure when I will get out to my garden as it is still under many feet of snow. Yikes! marlys I thought we lived in the frigid Midwest, where are you? Kathe, you couldn't have better timing. :-) We've been talking about doing just this. Thank you so much for the step by step. I don't have a green thumb, so this is perfect! Thanks, again! I love having fresh herbs close at hand! What a great way to lift the flavor of your summer dishes! I have been in a funk lately also! I thought spring fever would give us more energy! Thanks for sharing this great post at the In and Out of the Kitchen Link Party! Happy growing! I'd love to able to use these, but with a raised bed garden plot that's 20x20 (feet), it doesn't quite fit in the pocket book. Keep us posted on how things grow! What a great idea!! Sunburned nose? I'm still waiting for it to get a bit warmer!! 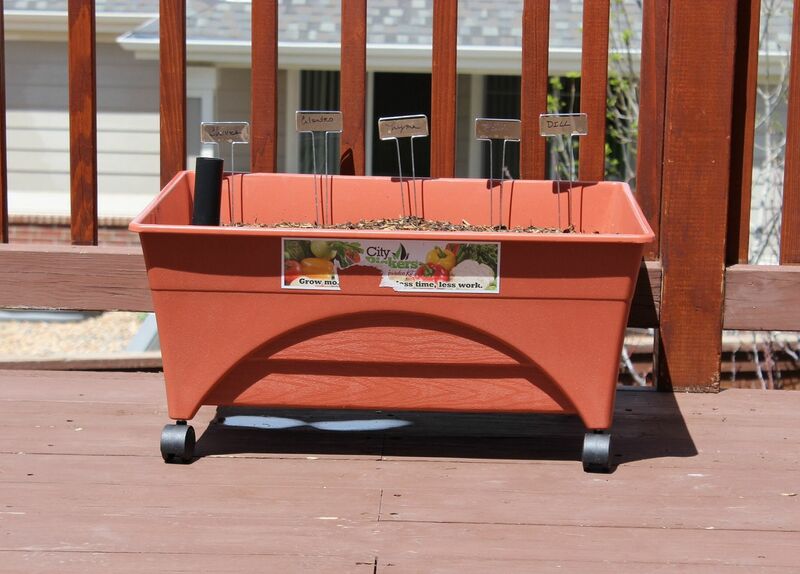 I have a teenie yard and so we do a ton of container gardening too.. this kit is really cool! Love your containers and I love to garden all kinds of pots. It always looks so pretty and I can move it around too. Thanks tons for linking to Inspire Me. Love your herb garden! I have a container exactly like the one that was left. I drilled drainage holes in it, and it works fine. I don't have a wood deck to worry about, though. I just planted it with bright pink zonal geraniums, purple petunias, and sweet potato vines. I want to do some container gardening! Homegrown anything is better than having to run out to the store, right?! Thanks for sharing at "Share Your Stuff Tuesdays" (Rachael @ http://www.parentingandhomeschoolinginfaith.com) Please come back & link back next Tuesday!!! I love that its on wheels! I hate when I plant something and want to move it later and it's just too heavy for me to lift :( this would be perfect!!!! What a great little garden! We have such a small garden in our tiny yard, but this would be great because we could move it around depending on how we use the space back there. Those wheels are a great feature! Kathe, I love this idea, and the container is perfect. You know Home Depot is going to love you for all the containers you have helped sell! :) Thank you for sharing this with us at Treasure Box Tuesday- I have pinned and shared on Google+!